I love a gardening challenge and for me growing cantaloupes was a new adventure I was curious to dive into. I had tried in years past with French muskmelons but had no luck getting them to reach full size and ripen. This season, I selected the variety Minnesota Midget due to its reputation of early ripening and great flavor. I chose to start my seeds at home because I have never seen these starts offered at my local nursery or hardware store. When all danger of frost had passed and the soil temperature was a steady 65F, I planted my starts outside under a 5 gallon water bottle cloche until early July. I grew two plants in the ground, under black plastic and one in a large black container. All the plants did well but the one in the container fared the best and produced 5-6 perfect little melons. These softball-size muskmelons grow on polite three- to four-foot vines instead of taking over your whole garden. 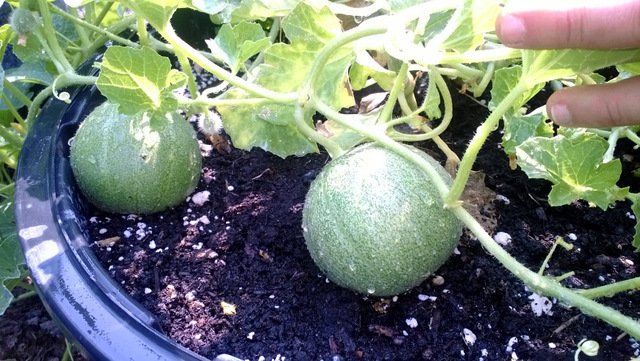 The melons were very easy to grow and carefree, I did however add a cup of organic fertilizer to the planting hole and watered them with fish emulsion once a month for three months as they grew. The one mistake I made was to over water one of my plants which made the fruit very mushy. Now I know to water the mature plants with fruit sparingly. Here are three Minnesota's next to a supermarket melon. Cantaloupes are ripe when they pull off the vine with ease...no pulling should be necessary. You can also tell they are ripe when they are incredible sweet smelling. After picking a few melons and placing them in my car, I immediately noticed the heady fragrance coming from the fruit as I drove home! As of today August 11, 2015, I harvested the last of my two melons. The melon were very sweet and had a good flesh to seed ratio. They are quite thin skinned but easy to eat with a spoon much like a grapefruit half in the morning. They make for a very lovely breakfast. Lemon or Cucumber or Both? I have grown lemon cucumbers for years. They are an heirloom variety that is believed to have come to the U.S. in the 1900's. They are tennis ball sized, yellow in color like a lemon but they do not smell or taste lemony at all. They are a wonderful size because you can eat the whole thing in one sitting with no leftovers. Easy to grow and quite carefree, they are vigorous plants that need caging or trellising. They bear fruits later than the "normal" green slicing cucumbers but taste just as great. Perfect for slicing, pickling (we make refrigerator pickles out of them), grating into raita and much, much more. I do notice they have a greater seed to flesh ratio than green slicing cukes but that has not prevented me from growing them at all! Lemon cucumbers of various sizes, we have 4 plants and harvest 3-6 cucumbers every 2-3 days. I have harvested golf ball sized fruit and baseball sized fruit as well. They are very prolific and easy to grow. Note: They can be prickly, harvest with gloves or just be careful. I quickly rub the spines off after I pick them. Lemon cucumber in comparison to a 7 inch Super Slicer cultivar. Both make wonderful pickles that are now a summer staple in our household. These cucumbers are lovely to look at. They seeds are soft and delicious, no need to toss them out. I hope you will try them next season. Cuor di Bue means Oxheart in Italian. This is an indeterminate Italian heirloom that KIS organic donated to MCGA and I was the happy recipient of this hard to find variety. They produce beautiful 12-oz. fruit have a delicious sweet taste. They are similar to the shape of a heart and are great for fresh eating or cooking. I was surprised that the fruit never got red, they remained and orangey-red even when quite ripe. Here is the Cuor di Bue next to a ripe peach. This particular tomato weighed 12 ounces. The heart shape was adorable. My children almost did not want me to cut it up and eat it. This thin skinned tomato made the best homemade tomato sauce. The flesh was thick, pulpy and acidic with very few seeds. Our recipe was super simple, saute 2 smashed garlic cloves in olive oil, add 1/2 C. diced onion, season with S +P, saute until everything is soft. Add 4 C. roughly chopped tomatoes. Cook until soft, add flavorings like basil, oregano, tiny bit of balsamic, red wine or cream to make tomato bisque. I use a stick blender to puree it directly in the pot. Simple and delicious. Epic tomato sauce being prepared! Cherokee Purple is a cultivar (cultivated variety) of heirloom tomato. They were “discovered” and named in 1990 by retired chemist Craig LeHoullier and are thought to have been passed down from Native Americans of the Cherokee tribe. The vines are indeterminate and vigorous growing up to 9 feet. They benefit from strong staking or caging. Their fruits average 16 ounces! 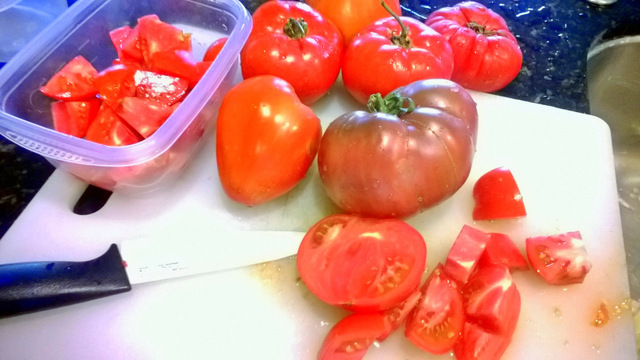 These beefsteak tomatoes are purple, brown, greenish brown and mahogany with green shoulders. They may not be the prettiest dark tomato but they win taste test after taste test all across the country. I picked my tomatoes when they are almost ripe and leave them on the counter (never in the refrigerator) to fully ripen. Cherokee purple tomatoes have many color variations so I give them a super gentle squeeze before I pick them. The stem is often quite thick so I recommend using scissors or pruners to harvest them. I have a special trick I use with my tomatoes before I harvest them. I withhold water for 1-2 days in order not to dilute the flavor of my fruits. We sliced the tomatoes, layered them with fresh mozzarella for the most delicious caprese salad. This tomato was so sweet it even rivaled the flavor of cherry tomatoes with no hint of acid at all. This tomato was the biggest one I harvested this year. I was hoping for a 2 pounder but no cigar this time. There is always next year!